Did Serena Williams Cheat with Coffee? 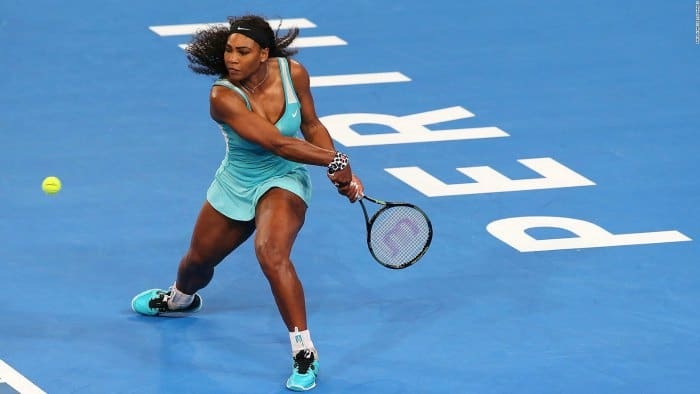 Serena Williams LOST her first set 6-0 to Flavia Pennetta at the Hopman Cup in Perth, Australia. With the jetlag, she decided a coffee might perk her up. Serena recovered to win 0-6, 6-3, 6-0 in hot, sweltering weather. Coffee and caffeine is a stimulant. No arguments here. 4th reason: (but not the reason why I take it): it helps increase metabolism and burn fat. Even without working out, I can maintain a BF of less than 10% and I think that is attributed to my metabolism, with coffee being one of my reasons for staying lean. 5th reason: (for long distance and marathon runners): it helps increases the blood level of free fatty acids available for metabolism, instead of using glycogen. This only works with slower running speeds. It also helps delay fatigue (or perceived fatigue) which is why you see caffeine in products like Goos, Gels, and Clif Shot Bloks. Mike Kreaden, are you reading this? The performance boost you get from caffeine is a result of how it hot-wires your central nervous system, says Matthew Ganio, PhD, an exercise physiologist at the Institute for Exercise and Environmental Medicine in Dallas. “Caffeine crowds out a calming brain chemical called adenosine,” he says. You become more alert, you react faster, and you don’t feel like you’re working as hard, all of which add up to training or competing at a higher intensity for a longer period of time and being more agile in a pack. “In reasonable doses, caffeine alone won’t lead to more bathroom breaks during a ride or a greater risk of dehydration,” says Mindy Millard-Stafford, PhD, former president of the American College of Sports Medicine. The upshot, she says, is that regardless of whether you supplement with caffeine, you don’t need additional fluid to avoid performance-sapping dehydration during a ride. The long-held belief that caffeine can muck with your body’s ability to regulate heat during exercise in hot weather has also been muted by science. Your body eventually adapts to the effects of caffeine, limiting the performance benefit. If you regularly drink more than five daily cups of coffee, Ganio recommends tapering your intake by a half cup a day for several days prior to a big ride, saving higher amounts of caffeine for before and during actual events. So by not drinking coffee or espresso on a regular basis is one reason why the effects was greater for Serena Williams! It takes 60 minutes for caffeine to start affecting the body, so imbibe one hour before a ride. “For rides lasting two hours or more, take half of your caffeine before and the other half in divided amounts during the ride,” says Ganio, “making sure to consume the remainder when there is more than an hour left in your ride.” Say you plan to take 200mg of caffeine for a three-hour ride: Aim for 100mg one hour before you get on the bike, and 50mg at the beginning of each hour thereafter. “While caffeine can boost performance by 3 to 5 percent, training can bring about improvements by upwards of 50 percent,” Ganio says. There’s also the possibility of getting over-amped and going out too hard too soon, leaving you with nothing in the tank well before the ride’s end. Bottom line: No amount of caffeine will turn a donkey into a thoroughbred. As mentioned above, since it takes up to 60 minutes for caffeine to start affecting the body, some people I know drink a cup of coffee or espresso, then immediately lie down to take a short 15-20 minute power nap. When they awake, they will be supercharged with the caffeine in full effect! Truth is stranger than fiction. Especially in Track in Field. With the indoor season well under way, I want to remind those athletes in the NCAA that caffeine is still on the list of controlled substances. The NCAA maximum acceptable level is 15 mcg/mL (micrograms per millilitre) in the urine. Now unless you have a Starbucks Venti sized drip coffee with an extra shot of espresso, a Rockstar Energy Shot, a couple of No-DOZ pills, and the new improved Vitalyze, this limit shouldn’t be a problem. A standard drip coffee has around 100 mg per 8 oz cup (250 ml), and 100 mg of caffeine equates to approximately 1.5 mcg/mL in the urine, so you’re looking at 10 cup of coffee IN ONE HOUR to produce a sample of 15 mcg/mL . Can you spell ectopic focus? 12 grams, or 12,000 mg of caffeine can actually kill you. That’s a lot of coffee. Like alcohol, caffeine is metabolized in the liver. The half-life time, or the amount to break down to 50% levels, depends on age, liver function, and other medications such as female oral contraceptives (which slows it down by almost 50%). The estimated half-life in adults is anywhere between 5 hours in a healthy male to 10 hours for a female taking oral contraceptives. So your window of testing positive is pretty high if you consume too much too soon. If you consume too much caffeine close to the test, you may want to take the test right away before all the caffeine gets absorbed. Moreover, if your caffeine was ingested a while ago, then delaying the test as long a possible is the key. In an alcohol breathalyser, you have 2 hours to contact your lawyer to be present before you are forced to take it. Refusing to take it is equivalent to a positive test. Good luck sleeping after the track meet! I guess that’s where a few beers come in. For a complete list of products and their caffeine levels, check out the caffeine database.